Camerata Pacifica's April concert. 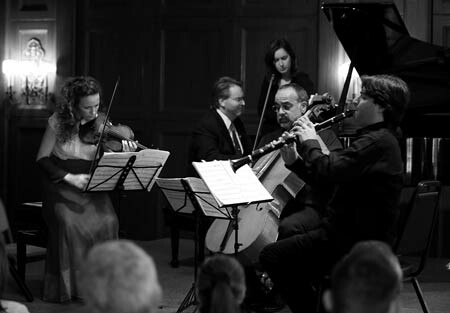 At Lotte Lehmann Hall, Music Academy of the West, Friday, April 20. At the opening of Camerata Pacifica’s April concert, Adrian Spence assured the audience that there would be no difficult music on the program, just lots of “vacuous virtuosity.” The musicians then played Cafe Concertino by the Australian composer Carl Vine, a work for flute, clarinet, violin, viola, cello, and piano that is based on a formidably intricate scheme for creating tonal ambiguity-just the kind of academic exercise Spence claimed to have foresworn. Yet despite the complex formal gamesmanship involved in its composition, Cafe Concertino has a moody urgency that was very winning as played by this gifted group-far from vacuous, but certainly not lacking in virtuosity. Adrian Spence and special guest Jose Franch Ballester on clarinet engaged in a particularly memorable duet, and the other players were the cream of Camerata’s enviable crop-Catherine Leonard, violin; Richard O’Neill, viola; Emil Milland, cello; and Warren Jones, piano. For the Tempest Fantasy of Paul Moravec, Jones left the piano to Kevin Fitz-Gerald, who was joined by Franch Ballester, Leonard, and Milland. The work showcases the clarinetist’s ability to play both the more conventional soprano B-flat instrument and its bigger B-flat brother, the bass clarinet. Franch Ballester, who will appear at the Lobero with the Santa Barbara Chamber Orchestra on May 1, is a rising star with tremendous musicality and a superb control of tone. His playing on the Moravec Tempest Fantasy was restless and modern, seeming to challenge the violin and the cello to transcend their 18th-century roots and embrace a more 20th-century aesthetic. Just looking at the expression of happy amazement on the face of pianist Warren Jones during and after the Brahms Clarinet Sonata in E-flat Major, No. 2, Op. 120 told the whole story of Franch Ballester’s achievement on this piece, but fortunately the audience had further evidence. This was reed playing of the most subtle and consummate artistry in the service of some of the greatest and most lyrical of all sonata writing. The encore was “Oblivion,” a bittersweet tango by Astor Piazzolla. Congratulations to Camerata Pacifica for continuing to present challenging and original programming alongside such rewarding traditional chamber music.